The Dr. Explains things in a way you can understand and takes the time to explain test results. I have seen Dr. Raza three times since May 2018. He takes the time to listen to my concerns, and toanswer questions. Dr. Raza has been very thorough in explaining diagnosis and treatment. My previous cardiologist retired and I went quite a while without the proper care. I am happy to have found Dr. Raza. I have seen Dr. Raza three times since May 2018. He takes the time to listen to my concerns, and to answer questions. Dr. Raza has been very thorough in explainingdiagnosis and treatment. My previous cardiologist retired and I went quite a while without the proper care. I am happy to have found Dr. Raza. 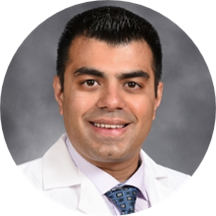 Dr. Zohair Raza is a proficient cardiologist serving the locality of Clifton, NJ. Dr. Raza earned his medical degree from Aga Khan University Medical College. He then completed his internship and residency at the Pennsylvania State University. Dr. Raza is affiliated with Valley Hospital in Ridgewood, NJ. He is board-certified in cardiovascular disease by the American Board of Internal Medicine. Patients visit him at Valley Medical Group Cardiology Center of North Jersey. He is skilled in his domain of expertise and treats patients with the thorough and prompt attention they deserve. Dr. Raza is a strong believer of engaging in the process of well-being and development of patients in an efficient and effective manner. He focuses on all aspects of a patient's experience which drives him towards excellence in providing healthcare. Dr Raza is kind and compassionate and will spend as much time with you as you wish.